My favourite book so far this year! Granted the year is still young, but I anticipate recommending this incredible story all year long. 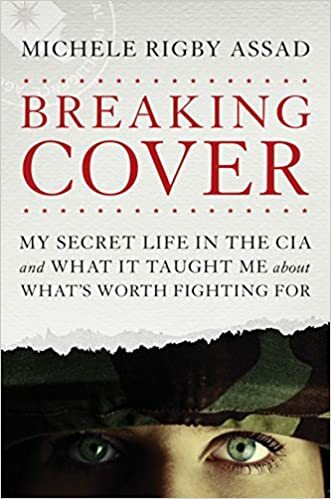 Breaking Cover is the stranger than fiction account of Michele Rigby Assad, a former undercover officer in the National Clandestine Service of the US Central Intelligence Agency. She served for 10 years in this demanding and thankless role together with her Egyptian born husband Joseph, also an agent. She and her husband were assigned to some of the most dangerous and unpleasant countries on the face of the earth. I was intrigued by her ability to emotionally disarm her contacts. Petite, easy on the eyes, friendly ...all qualities she used with great success. She never compromised her faith in Christ but was still able to detect and defuse, strategize and analyze to the benefit of her country. She had to overcome the "stigma" of being a woman in countries where females are denigrated and denied basic rights. She won the respect and listening ear of those who would have minimized or even ridiculed her abilities as a top and trustworthy operative. I am an American so perhaps you will think I am biased in this positive review of a woman who used her honed skills to serve her country. My greatest admiration is reserved however, not for her CIA capability, but her mission AFTER she left the CIA. She and her husband helped lead a rescue mission to relocate internally displaced Iraqis to Slovakia. Now that brought tears. For more information on Breaking Cover by Michele Rigby Assad, visit our website here. "A probing tale that reminds us that mercy can shape even the most broken among us into an imperfect yet stunning masterpiece." I finished this book in two days. I'm pretty sure that's the fastest I have ever read a book. When I found out Francine Rivers was coming out with a new book, I immediately put one on order for myself and impatiently waited to devour it. Each book of hers that I've read is best described as a vortex: I get sucked in, and I don't come out until I'm done reading. I didn't do anything for two days but read her book and get swept away by another incredible story. The Masterpiece follows Roman Velasco; a tortured artist who appears to have everything. Money, fame, and women. Only Grace Moore, his newly hired (and sort of reluctant) personal assistant knows how little he truly has. The demons that haunt Roman echo throughout his mansion, and to deal with them he disguises himself and becomes the Bird - a graffiti tag artist; an alter ego that could destroy everything Roman has built for himself and land him in prison. Like Roman, Grace has secrets of her own. After a disastrous marriage threw her life completely off-course, Grace vowed never to let love steal her dreams again. But as she slowly begins to get to know Roman, the pieces of both their jagged pasts slowly begin to fit them together. This story broke my heart. Shattered it. I found myself weeping at times. And let me tell ya... that doesn't happen often. Francine Rivers knows how to tug at heart strings, and is very good at it. She so brilliantly brings in the gospel in such a beautiful, unique way every time she writes a book. If you loved her books Redeeming Love and Bridge to Haven, you have to pick this book up. I promise you, you won't be sorry. 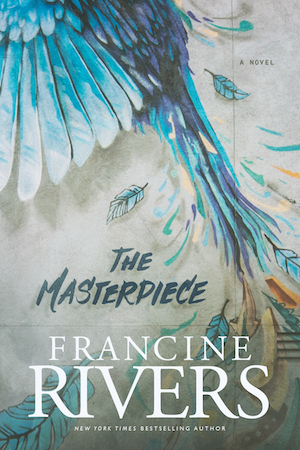 For more information about The Masterpiece by Francine Rivers, visit our website here. Though this book may have been recommended highly by Rob Bell, author of Love Wins and What is the Bible? - "A great book about the Book" - that is not why I'm here. This is another notoriously controversial topic and, as I have come to know, it is therefore a point of interest for me. I may detest debate and conflict, but I love reading about controversial topics and hearing perspectives that seem to get shut down before they even have the chance to make it off the ground. Peter Enns wrote The Bible Tells Me So to explore "why defending Scripture has made us unable to read it". He is a highly intelligent man who has taught courses at several post-secondary institutions, including Harvard University, Fuller Theological Seminary, and Princeton Theological Seminary, but he writes in an easy conversational way, not bogged down by complicated terms and strings of words that quickly make a sentence meaningless to those of us who do not teach university-level theology. He approaches such questions as how to reconcile the violence in the Bible with the unfathomable, unending love of God; how to approach the contradicting passages in the Bible, or the incomprehensibly strange portions. Enns' big question is "what do you do when the Bible doesn't behave?" and he approaches it with a a deep and intimate respect for Jewish and Christian Scripture. All the while, he keeps that conversational tone of a friend explaining something over coffee - passionately, and with great conviction, but also great gentleness and humour. Enns is like that High School teacher everyone encountered or heard of, who entertained his classes with jokes and bad puns woven into the most impassioned, interesting lectures and coursework you could ever hope to experience. Even the students that talk all the time or spend the class on their phones have to pay attention every once and a while because he's just so quirky. Perhaps the most beautiful thing about this book - I have found - is that, regardless of whether I agree or not, I do not feel pressured to agree with him. He is not claiming to have all the answers and to know, resolutely, that this is the new, right way to interpret everything, so that life becomes clear. As with his latest book release, The Sin of Certainty, Enns dwells in the reality of being unsure. He is open to change, adaptation, and the alteration of ideas. So long as there are ideas to be had and theories to be made, he will keep on asking the questions that desperately need to be asked. For more information on The Bible Tells Me So, by Peter Enns, visit our website here.